Thank you for your interest in a Catholic high school education for your child. A Catholic high school education in the Diocese of Wilmington is a gift of faith and academic excellence for each student enrolled. In addition to an academic program of highest quality, teaching and learning are infused with the Catholic faith. In the classroom, through extracurricular activities, on the playing field, and through service to others, Catholic high schools develop young men and women who are faith filled, competent, and confident as they prepare for college and careers. Registration for the 2018-2019 school year is not currently open. The Diocese of Wilmington will administer the High School Placement Test (HSPT®) at our diocesan and parish high schools the first weekend in December. All 8th grade students are encouraged to register online. The High School Placement Test is an important step in the process of successful admission and placement in a Catholic diocesan or parish high school. This test is used for admission, scholarship, and placement decisions. Online registration will close at 11:59 p.m. (CST) on November 29, 2018. Saturday, December 1, 2018 – 8:30 a.m.
Register online for the HSPT here. Choose your testing date and location. Click “Register Student” below for the high school where you wish to take the test. TEST MUST BE TAKEN AT STUDENT'S FIRST-CHOICE SCHOOL, NO EXCEPTIONS. When registering, designate up to two (2) high schools to receive your test scores. You must select the school where you are testing as your first-choice. Pay $65.00 registration fee online (or see alternate payment options). Receive immediate registration confirmation. Keep your email confirmation and registration number in a safe place. Students will need to bring a copy of their registration number with them on the day of the test. Credit Card - You will have the option to pay with a credit card online at the end of the registration process. All credit card payments must be made by 11:59 p.m. (EST) on November 29, 2018. Note: All credit card funds received will be forwarded to the Diocese of Wilmington. Payment through this system does not constitute any client/customer relationship between the site vendor and the parent/guardian. Cash - If paying by cash, please bring payment and a copy of your confirmation directly to the Catholic Schools Office located at 1626 N. Union Street, 2nd Floor, Wilmington, DE 19806, between the hours of 8:30 a.m. and 4:30 p.m.
All check, money order and cash payments must be received by the Catholic Schools Office by 12:00 noon (EST) on November 29, 2018. If payment is not received by this date/time the student will be considered unregistered. After the student has registered, prior to the test date, each high school will communicate to the prospective student/family the particulars for the day, including arrival instructions, what to bring, etc. Students should plan to arrive at least 30 minutes prior to the test and bring a copy of his/her registration confirmation with registration number and at least two #2 pencils. The HSPT is a three-hour test. Students should get a good night's rest and eat a healthy meal prior to the test. Parents/guardians will receive a copy of their child’s test results via mail or email. Only one delivery method is available, which you will designate during the registration process. Test results will be released to parents/guardians on Saturday, January 12th. Families who selected to receive their scores via the postal service should receive results in the mail early in the week of January 13th. If you have any general questions regarding the registration process, please call the Diocese of Wilmington Catholic Schools Office, 302-573-3133. If you have questions pertaining to a specific high school or regarding your completed registration, please contact the Admissions Office of your preferred high school. Why should a student take the HSPT? For over fifty years, academic high schools nationwide have used Scholastic Testing Service, Inc.’s High School Placement Test (HSPT) to assist with admissions, scholarship selection, and curriculum placement. The HSPT is a comprehensive test for eighth graders for placement in the ninth grade. What if I have multiple students to register (twins, triplets, etc.)? Each student must be registered separately, completing the entire registration process for each student. Do not hit the “back” button to try to register an additional student. Each student must have an individual record and registration number. May a student take the test at any location? The test MUST be taken at the student’s first-choice school. There are NO exceptions. If a student chooses a test location other than the first-choice school during the registration process, he/she will be contacted by the Catholic Schools Office to correct the error. What if I don’t see my high school choice on the list? Private high schools in the Diocese of Wilmington have separate testing procedures and should be contacted directly. How many schools may a student choose to receive test results? Students may select up to two schools to receive test results. Every high school testing site offers extended time to students with a documented need. Other accommodations vary according to the high school. You will need to contact the admissions office of your first-choice high school to discuss the steps needed in submitting documentation prior to the test. How do I pay for testing? Pay online using a credit card. Accepted credit cards are American Express, VISA, and MasterCard. 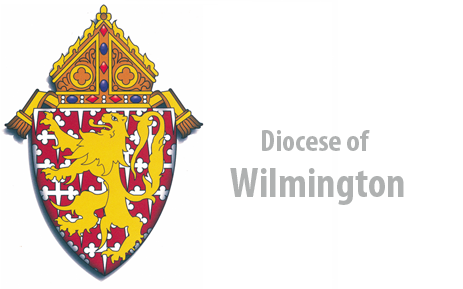 Pay the Diocese of Wilmington directly using another method of payment. See instructions above. There was an error in processing my credit card payment online. Can I try paying online again? If there was an error during processing, or if your card was declined, you may do one of two things. Pay online using another credit card. Click on the Already Registered link at the top of the page. Under Update Registration, type the email address you entered during registration and the registration number you received and click Login. Click the Pay with Credit Card button at the bottom of the page. To make changes, click on the Already Registered link at the top of the page. Under Update Registration, type the email address you entered during registration and the registration number you received. Click Login to access your registration and make any changes. Registration information may be changed up until two days prior to the scheduled test. Can I change my high school choices after I register? To make changes, click on the Already Registered link at the top of the page. Under Update Registration, fill in the email address you entered during registration and the registration number you received. Click Login to access your registration and make any changes. What if I missed the test date I signed up for? Contact the high school where you were scheduled to take the test. Please be aware registration fees are non-refundable. To cancel your registration, contact the Admissions Director at your first-choice school/test site. What do I do if I miss the deadline and registration is closed? Contact the Admissions Office of your first-choice high school immediately. Which confirmation is the student supposed to bring the day of the test? The student needs to bring the registration confirmation with his/her confirmation number listed. I never received an email confirming my test registration. What should I do? Click on the Already Registered link at the top of the page to resend the confirmation email. Under Resend Confirmation Email, fill in the email address you entered during registration and click Send Email. Be sure to check your email SPAM or Junk folder, as well. If you still do not receive an email confirmation, call the Admissions Director at the school where you registered to take the test. He/she will be able to provide you with your confirmation number. You should also confirm the email address entered during registration, as this is where emailed test results will be sent. Test results will be released to parents/guardians on Saturday, January 12th. Student’s scores will be delivered via either mail or email, whichever was designated during the registration process. Families who selected to receive their scores via the postal service should receive results in the mail early in the week of January 13th. Can I change the delivery method of my test results (email vs. mail)? Can I get both an email and a paper copy of my test results mailed to my house? Parents will receive a copy of student test results via either mail or email. Only one delivery method is available, which you will designate during the registration process. Can you send my test results to more than one email or home address? Scholastic Testing Service, Inc. will send your test results to one address only – either the mailing address or email address specified during registration. Can you send my test results to a different high school? If you need to have your scores sent to a different high school, contact the Admissions Director at the school where the student tested after test results have been received. I never received a copy of my test results. What should I do? If you chose to have results mailed to your home, please allow at least a week from the date the reports were made available before contacting STS. Families of students testing in the Diocese of Wilmington will receive a Student Score Report sent directly to their home or email. To learn more about how the HSPT® is scored and what your scores mean, visit http://ststesting.com/hspt . Each school evaluates your scores in its own way. Criteria determined by one school to assist with academic decisions may not be the same for another school. If you have questions about how individual schools use your HSPT® scores, please contact the school directly. Copyright © Scholastic Testing Service, Inc.
Can’t Find Your Registration Number? Click the Already Registered link at the top of the page. Under the Resend Confirmation section, enter the email address you registered with. Click the button to resend the confirmation email to the address on file. Need to Make Changes to Your Registration? Click the Already Registered link at the top of the page. Under the Update Registration section, enter the email address you registered with along with your registration number in order to log in and make changes. For technical assistance, contact support@ststesting.com. For all other inquiries, please contact the school where you are testing.